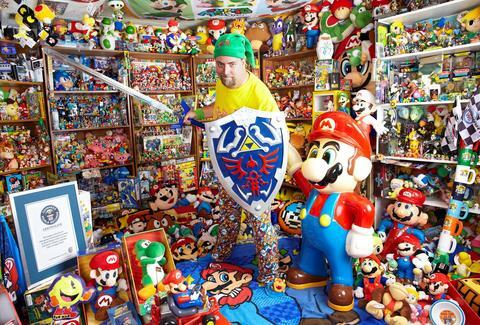 It’s worth over $100,000 and is owned by a web designer who started the collection with a Super Mario figurine his parents gave him when he was 8 years old, or pretty much the same age he is now. In December 2013 two pairs of dudes (obviously) played pool at Corner Pocket West in Colorado Springs for 100 hours. Just to clarify, that’s MORE THAN FOUR DAYS. 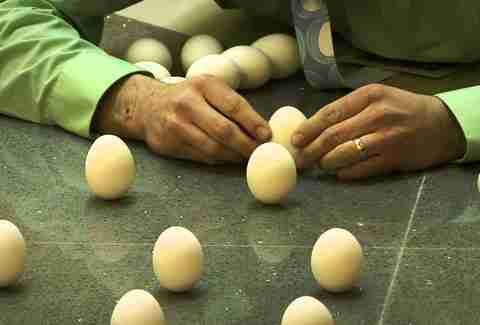 Apparently, it’s not only possible to balance a single egg on its end, but you can stand up a full dozen of ‘em in just One minute, 6.45 seconds. Of course, by “you” we mean Brian Spotts, a guy who discovered he had this talent in college, and spends time carefully selecting suitable eggs for his attempts. ... is 484. They did it at a high school last fall, and then donated said T-shirts to charity. 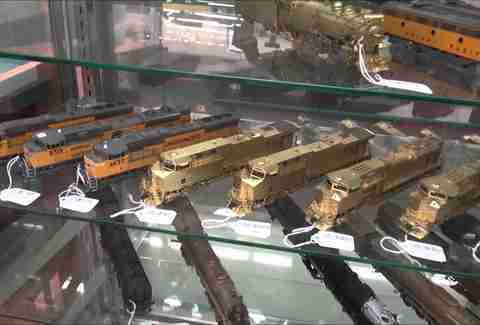 Denver’s Caboose Hobbies was opened in 1938, has over 100,000 items on display, and boasts over 18,600sqft of floor space, or enough to house a genuine, full-size, 3.5-ton Plymouth-type CLH locomotive alongside all the miniature ones. ... was created by researchers at the National Institute of Standards and Technology at the University of Colorado and uses carbon nanotube technology to create an edge capable of slicing samples only 300 nanometers thick. It is... sorry’boutthis!... truly cutting-edge technology! ... is 280 (rolled last year at The Back Bowl in Eagle, CO), aka higher than what you can bowl the normal way. 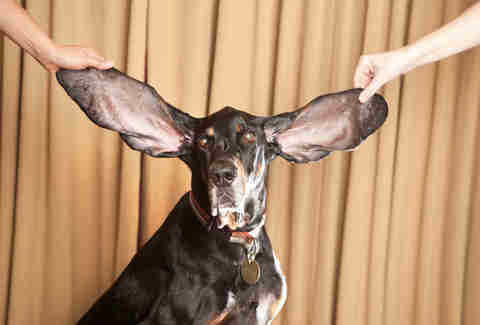 Harbor, a black and tan coonhound weighs 89lbs, and has ears that measure 12.25in and 13.5in for the left and right ears, respectively. Oh, and he’s totally freaking cute, obviously. Five guys travelled over 194.21 miles on the Colorado River in 2006, and thus broke the most Colorado record ever. 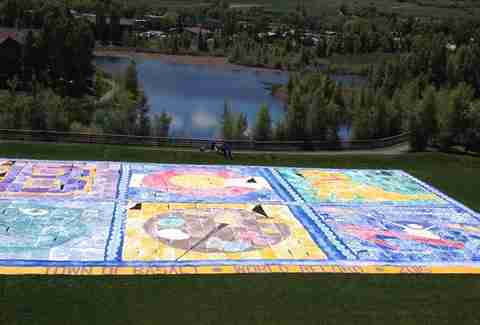 ... was created in Basalt and measures 21,752.83sqft, which is, um... pretty big, apparently. 372 people got together in Lyons in 2011, each with their own Etch A Sketch, and drew a picture of Steamboat Mountain simultaneously. Or tried to anyway. 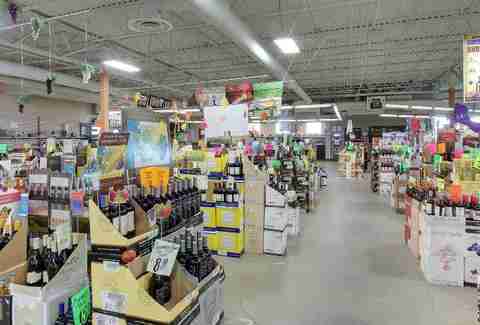 Daveco Liquors in Thornton, which has over 100,073.1sqft of booze, is basically a warehouse full of stuff that’ll make you say, “um, where’s my house” after you drink it. ... is 1,061. 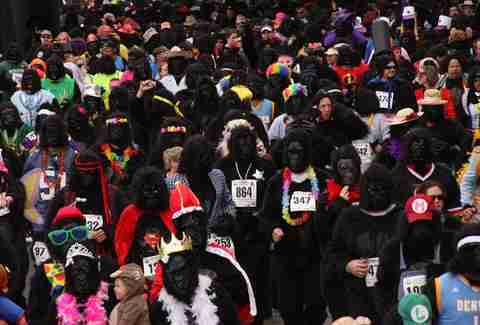 They got together in 2009 for Denver’s annual Gorilla Run. ... is two miles long and 58ft tall. 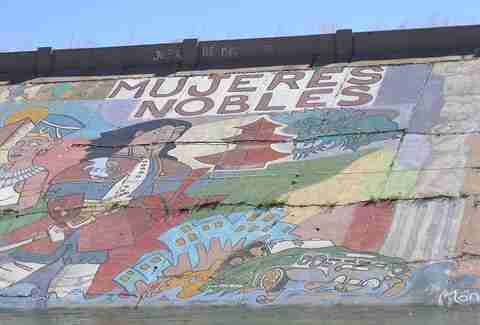 It’s on a levy in Pueblo, features everything from depictions of the history of women to Andy Warhol replicas, and is constantly growing since anyone can add to it as long as they use recycled paint. It is located at The Springs Resort and Spa in Pagosa Springs, and is at least 1,002ft deep, but no one knows exactly how far down it goes because the plumb line used by a hydrologist to measure the depth back in 2011 never hit the bottom. 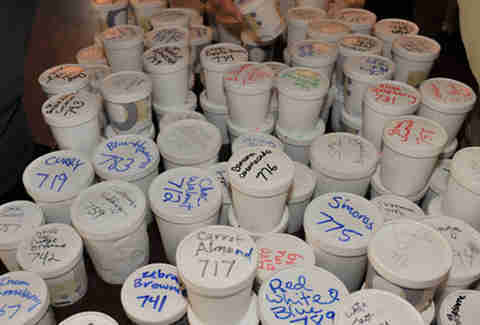 For five glorious minutes back in 2011 Crook’s Palace Restaurant in Black Hawk displayed 985 flavors, from vanilla to mango habanero to cinnamon cider bourbon, at the same time. No, we don't know why.